Our guides are frequently called upon to create custom tours. Founts of knowledge they may be, but occasionally these requests give them the chance to learn something new - as in today’s story. Read on to learn about how a New York-bound traveler who challenged our guide Rob to become a bit of an art detective in order to prepare for a different kind of tour. I recently had the good fortune to have a request for a private tour covering notable murals and mosaics in New York. Although I knew of quite a few, I needed to do additional research to dig up more gritty details and stories, of which there are many. The research and detective work is a big part of the fun of being a guide. As much as I enjoy conducting tours and meeting people, I’m also fascinated to dig deeper into what I ‘think’ I already know. 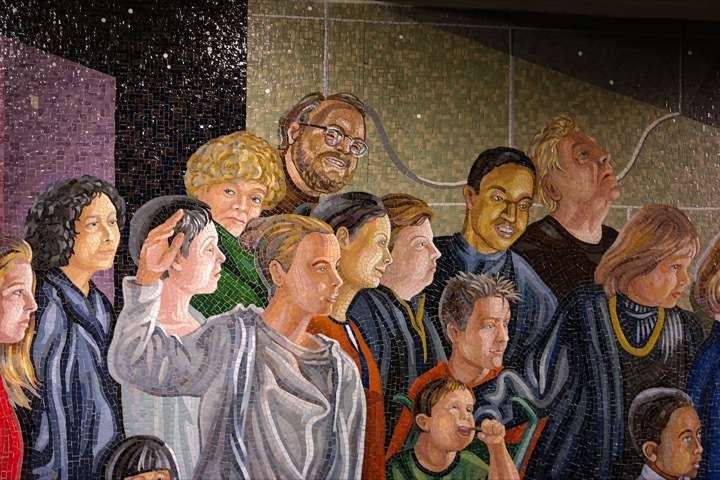 I found that the many mosaics in the subway stations of Times Square are a gold mine in itself. There is a long passageway there with a modern mosaic that harkens back to primordial Manhattan, with gold roots and flat, green bedrock. I uncovered a fascinating story about a favorite mural in the classic New York Public Library at 42nd street, a building whose collections match some of the world’s finest museums. I re-discovered one of the best examples of an Art Deco skyscraper in the city, the Chanin building, with its wonderful brass grill work that surrounds the lobby and elevators. Just across the street is the famed Chrysler building which some consider the peak of the Art Deco architecture. In Rockefeller Center, a true crown jewel of sculpture, murals, and relief work, you can spend hours admiring the immaculately maintained art. One of the pleasures of this tour is seeing works which no one regularly sees, even seasoned New Yorkers. There is the Courthouse in lower Midtown which is a masterwork of sculpture, murals and stained glass, but does not welcome anyone but lawyers and judges! It is however, a public building and you can gain access to it, sometimes only briefly, if you know how to arrange it. The same is true for a few other buildings which, though wildly inventive, are off the normal tourist trail. In one case, I have to request permission and an appointment to see a famous but rarely seen mural. It is well worth the effort. Others lay hidden in plain sight, if you know where to look. We are lucky that in this very aspirational and wealthy city, builders tried to surpass their competitors, so that even in the depths of the Depression, great artistic accomplishment not only did not diminish, but thrived. Another reason was the federal Works Progress Administration (WPA). They commissioned hundreds of artists in the 1930’s to beautify schools, post offices, train stations and the like, to keep the artists employed. Scores of these works exist throughout the city. Let me show you. Coming to New York anytime soon? Consider getting in touch with Rob to plan a tour for when you arrive. From Soho to Brooklyn, the East Village to Upper East Side, Robert is keen to show you the many faces of New York.